Demon Dance Launch at The Asylum. Well the moment has arrived and Demon Dance is launching next month in Lincoln. Join me at The Asylum on Friday evening, 10th September 2010 at The Lawns, Lincoln where Demon Dance, book 3 The Vampire Gene, will be exclusively on sale, prior to the official availability date of 17th September 2010. I will also be at the convention Friday and Saturday taking part in the programme and will be willing to sign copies of the book. And if you haven't bought the other two, don't worry. Copies of the award winning first novel Killing Kiss (Winner of Silver Award for Best Horror Novel 2007) and Futile Flame (Shortlisted for The BFS Award for Best Novel 2010 - Results announced FantasyCon on 18th September 2010) will also be available to purchase from The House of Murky Depths table throughout the weekend. So don't be shy! Hurry on down to The Lawns and say hello. And don't forget to dress up! Facebook Friends Finder - What a Pain!!! Full of a cold today I did that stupid thing of clicking on the Facebook friends finder as it is constantly suggesting I do! I have, I discovered, lots of friends in my inbox (and God only knows how it got in there as I didn't give it my password) that aren't on my facebook list. I went through, highlighting those who might be interested in joining my page, and left the rest blank. Er ... Facebook! I didn't want the rest of them to receive it! I thought that was the point of having an option to chose by ticking!!! Duh!!! Why do the powers that be at Facebook keep putting these crappy things up there? It's bad enough that I have to constantly refuse applications without it invading my inbox and spamming my friends and colleagues as well. I'm pleased to recommend this fabulous new literary book by author Graham Masterton with William S Burroughs. Rules of Duel was written between 1968 and 1970 when Graham was experimenting with Intersection Writing, a form of post-modernist writing that was made famous by Burroughs during his career. 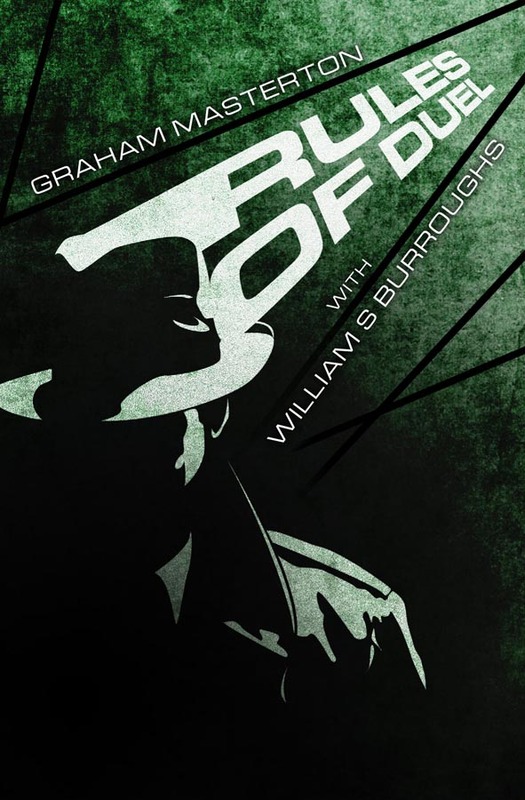 Here's an interview with Graham on RealityStudio, where he talks about the book and his friendship with Burroughs. The book is due to be launched Autumn 2010 by Telos Publishing along side a reprint of Graham's well known masterpiece The Djinn. So hurry up and order your copy today from Telos!!! After an awful day yesterday, with my MG breaking down again and four hours of waiting to be towed home by the AA, I went out with my partner David for a much needed steak dinner and a bottle (or 2) of wine. When I arrived home I did my usual email check - and found much to my surprise this wonderful link to a review by Jan Edwards of Killing Kiss. It really cheered me up to see a review that showed such good understanding of everything I tried to do in the book when I wrote it in 2006. Not only that - but I was told the review was going onto amazon also and so I went and had a quick look there to see if it was up yet. And much to my surprise discovered these reviews by Demonica. Demonica had, I discovered, been reluctant to read Killing Kiss as generally she doesn't like vampire novels. Once she had started it, however, she discovered Killing Kiss was different. She also took the trouble to read Futile Flame and she'd LOVED them both. Writing is a solitary pursuit, often with very little reward, but it makes it all the more worthwhile when your efforts are appreciated. Futile Flame has been shortlisted for the British Fantasy Society, August Derlerth Award for Best Novel - voting ended on 31st July and I won't know the outcome until September 19th at FantasyCon in Nottingham, but whatever happens I will always remember that those who have read my work so far have often appreciated it. And if I don't win - I'm really routing for Conrad Williams and his fabulous post-apocalyptic novel One. Thank you for the reviews guys! And thank you for continuing to tune in - I hope Demon Dance thrills and excites you even more! Also - watch this space for my new anthology - announcements to be made soon! Snowdon Mountain Railway - What a Rip Off! Living in the beautiful country of North Wales, we receive many visits from our friends over the border in England to stay over for a few days. As a result I've taken the journey to Snowdon many times to show our visitors the sights. Llanberis Pass is among my favorite drive-throughs, the beautiful shaley rocks and exquite waterfalls are all a must see. And these sights are free, with the exception of Swallow Falls which is £1.50 per adult and a bargain as the waterfall - although I've visted many times now - never fails to impress me with it's roaring, powerful flow. Snowdon however is not a bargain. In fact I think it's a complete rip-off. A trip to the summit on the mountain railway will cost you £25 per adult and a whopping £18 per child. A family of four will have to pay £76 for a return journey which lasts approximately 1hr and 20 mins from start to finish. I took a friend recently and one look at the price was enough to say - actually - it isn't really worth it. Having said that, I've done the train journey to the first drop off point and the views are breath-taking but I still can't get my head around this rather extortionate costing. Can it be that the trains are that expensive to maintain? Or is this just another one of those, 'Let's rip-off the tourist' situations. As a result I won't be recommending the trip to any more of my visiting friends and family - which is a shame. However across the road is a rather lovely castle ruin which is perfectly accessible and fun to climb up - also - it's free.